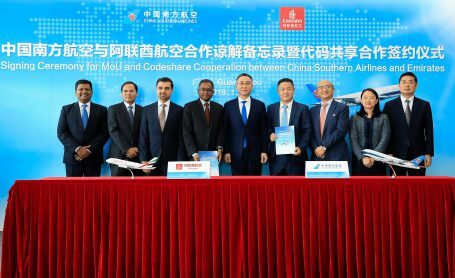 Emirates and China Southern Airlines (IATA code: CZ) have signed a Memorandum of Understanding (MoU) to progress a comprehensive reciprocal codeshare agreement, which is set to open up new destinations for passengers travelling between China and the Middle East and Africa. The partnership with the Guangzhou-based carrier also allows Emirates’ passengers to enjoy seamless connectivity on domestic flights within China, adding eight new destinations to its global network. The Chinese cities covered by the codeshare agreement include Fuzhou, Chongqing, Kunming, Qingdao, Xiamen, Chengdu, Nanjing and Xi ‘an during the initial phase of the partnership, subject to necessary government approvals.